Last week, following Jair Bolsonaro’s performance in the first round of Brazil’s presidential elections, when bolson exceeded predictions and won 46 percent of the first round vote, this column examined how Bolsonaro actually had more in common with Philippine president Rodrigo Duterte than with many other populists who have run for office in Europe and North America in recent years. Bolsonaro now appears likely to win the presidency in the second round of the election; polls have him leading the other final round candidate, Fernando Haddad, by sixteen points. It seems almost impossible that Haddad would win, given that the second round is in less than two weeks, and Haddad trails by such a wide margin. Bolsonaro and Duterte come from different ideological backgrounds. Bolsonaro, a former army captain, has been on the far right for decades. The Philippine president has in the past called himself a socialist, and has in office promoted some left-leaning programs on issues like family planning. But both have an authoritarian populist style that promises tough action, simple solutions to problems, and a strongman who will fight crime and right the economy, ignoring democratic norms if needed. 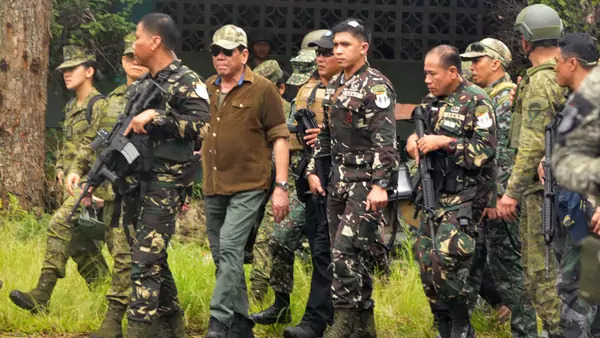 Both Duterte and Bolsonaro, like many autocratic-leaning populists who have gained power in the past decade, have emerged in relatively abnormal circumstances in their countries’ modern histories. (To be sure, when looked at over centuries, authoritarian or quasi-authoritarian rule is not an abnormal occurrence in either Brazil or the Philippines; the two states were autocracies in the mid-1980s.) In Brazil, a massive spike in violent crime and an economic downturn led to a curdling of popular support for mainstream parties and candidates, for instance, and paved the way for Bolsonaro’s breakthrough. And, like in many other instances of populists’ triumphs, Duterte built on his election and quickly gained enormous power over state institutions, even though he won the presidency with less than 50 percent of the total popular vote. Duterte has nonetheless gained dominant control over the lower house of parliament, and wields massive influence over the Supreme Court and Senate as well. He also has proven mostly invulnerable to public outrage over his abuses of norms and abusive language, policy missteps like his administration’s lack of preparation for the conflict in the Philippine south in 2017, questions over Duterte’s health, or other issues that might have been politically fatal scandals for other politicians. With Duterte’s reputation as a wild strongman baked into his political persona, scandal leaves little mark on him—just as scandal did not significantly harm the political fortunes of other autocratic-leaning populists like Italy’s former Prime Minister Silvio Berlusconi or former Thai Prime Minister Thaksin Shinawatra. So, like Duterte, Bolsonaro probably will be able to command vast power from day one, and expand his power base quickly—and his opponents will have more trouble combating him than they would another politician. Scandal, insulting public remarks—for which Bolsonaro is already known—these are unlikely to dent the public image of an autocratic-leaning populist. Indeed, as several authors have noted, autocratic-leaning populists often prove so politically enduring that they can make multiple comebacks from seeming political death. Autocratic populists become vulnerable only after years of public fatigue with their antics and endless crises, and/or when “normal” and major political challenges emerge, and their opponents can fight them on core issues, as Matthew Yglesias has noted, rather than battling about scandals. For Duterte, that could be the increasingly high price of rice, as well as rising inflation, although Duterte has amassed so much support in the legislature, and among the public, that he still looks likely to come out of the midterm elections next year relatively unscathed. For Berlusconi, the 2011 euro crisis was a leading factor that led to his ouster. But before normal politics could bring down an autocratic-leaning populist, they can rule for a very long time.